Rex Steele is Coming to Spain! That's right, Rex Steele is being published in Spain by Aleta Ediciones and will be available next month! 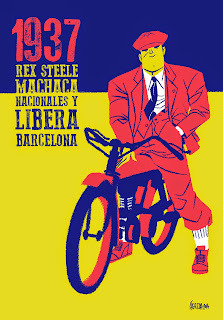 Not only that but myself and Rex's co-creator/writer Matt Peters will be attending FICOMIC, the comics festival in Barcelona May 15th-18th to sign copies of Rex Steele! To celebrate Rex Steele's arrival in Spain, fan art by the amazing Spanish comic book artist José Luis Ágreda! Sorry for the long absence from the blog, I've been busy making stuff. Soon the floodgates will open.